Fat cells in the human body. By analyzing the cellular circuitry underlying the strongest genetic association with obesity, a team of researchers from MIT and Harvard Medical School have unveiled a new pathway that controls human metabolism by prompting our adipocytes, or fat cells, to store fat or burn it away. Obesity is one of the biggest public health challenges of the 21st century. Affecting more than 500 million people worldwide, obesity costs at least $200 billion each year in the United States alone, and contributes to potentially fatal disorders such as cardiovascular disease, type 2 diabetes, and cancer. But there may now be a new approach to prevent and even cure obesity, thanks to a study led by researchers at MIT and Harvard Medical School and published today in the New England Journal of Medicine. By analyzing the cellular circuitry underlying the strongest genetic association with obesity, the researchers have unveiled a new pathway that controls human metabolism by prompting our adipocytes, or fat cells, to store fat or burn it away. “Obesity has traditionally been seen as the result of an imbalance between the amount of food we eat and how much we exercise, but this view ignores the contribution of genetics to each individual’s metabolism,” says senior author Manolis Kellis, a professor of computer science and a member of MIT’s Computer Science and Artificial Intelligence Laboratory (CSAIL) and of the Broad Institute. The strongest association with obesity resides in a gene region known as “FTO,” which has been the focus of intense scrutiny since its discovery in 2007. However, previous studies have failed to find a mechanism to explain how genetic differences in the region lead to obesity. To recognize the cell types where the obesity-associated region may act, the researchers used annotations of genomic control switches across more than 100 tissues and cell types. 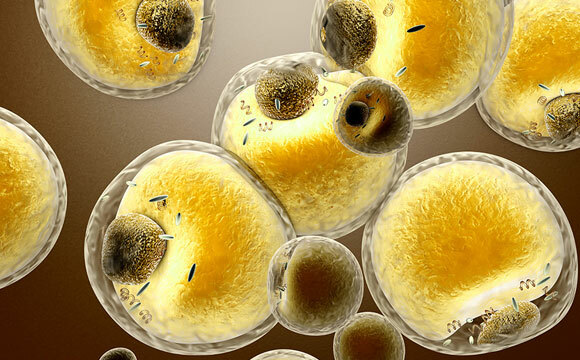 They found evidence of a major control switchboard in human adipocyte progenitor cells, suggesting that genetic differences may affect the functioning of human fat stores. To study the effects of genetic differences in adipocytes, the researchers gathered adipose samples from healthy Europeans carrying either the risk or the non-risk version of the region. They found that the risk version activated a major control region in adipocyte progenitor cells, which turned on two distant genes, IRX3 and IRX5. Follow-up experiments showed that IRX3 and IRX5 act as master controllers of a process known as thermogenesis, whereby adipocytes dissipate energy as heat, instead of storing it as fat. Thermogenesis can be triggered by exercise, diet, or exposure to cold, and occurs both in mitochondria-rich brown adipocytes that are developmentally related to muscle, and in beige adipocytes that are instead related to energy-storing white adipocytes. The researchers predicted that a genetic difference of only one nucleotide is responsible for the obesity association. In risk individuals, a thymine (T) is replaced by a cytosine (C) nucleobase, which disrupts repression of the control region and turns on IRX3 and IRX5. This then turns off thermogenesis, leading to lipid accumulation and ultimately obesity. By editing a single nucleotide position using the CRISPR/Cas9 system — a technology that allows researchers to make precise changes to a DNA sequence — the researchers could switch between lean and obese signatures in human pre-adipocytes. Switching the C to a T in risk individuals turned off IRX3 and IRX5, restored thermogenesis to non-risk levels, and switched off lipid storage genes. The researchers showed that they could indeed manipulate this new pathway to reverse the signatures of obesity in both human cells and mice. In primary adipose cells from either risk or non-risk individuals, altering the expression of either IRX3 or IRX5 switched between energy-storing white adipocyte functions and energy-burning beige adipocyte functions. Similarly, repression of IRX3 in mouse adipocytes led to dramatic changes in whole-body energy balance, resulting in a reduction of body weight and all major fat stores, and complete resistance to a high-fat diet. “By manipulating this new pathway, we could switch between energy storage and energy dissipation programs at both the cellular and the organismal level, providing new hope for a cure against obesity,” Kellis says. The researchers are currently establishing collaborations in academia and industry to translate their findings into obesity therapeutics. They are also using their approach as a model to understand the circuitry of other disease-associated regions in the human genome. The paper is a tour de force, according to Evan Rosen, a professor of medicine at Harvard Medical School who was not involved in the research. Be the first to comment on "Researchers Discover Pathway That Controls Metabolism"